As a child, I used to spend my weekends and school holidays on the small farm our family owned. One of the very special things about this farm was the very natural contact that we had with horses there. It was free, unstructured, spontaneous and sometimes very “off-the-cuff” horse husbandry! 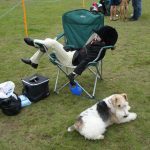 This "off-the cuff" horse husbandry was OK whilst things went well…. but one day, when I was 12 years old, I found myself holding the head of a baby horse in my lap, trying to save its life with my limited 12 year old experience. I was on my own, it felt, fighting for this foal’s live (with only love, intent ….and porridge) The foal died with his head on my lap a few hours later. I was heartbroken. 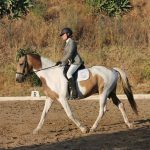 I felt I had let that baby down and in that moment vowed that I would dedicate my life to learning as much as I could about horses so that I never, ever, let a horse down again. Looking back, I believe that was my calling. By the time I’m 14, my parents are divorced… the farm is sold. Before I know it, or have a chance to say bye bye, I never see any of the horses again. I only heard a couple of years later that one of them, my favorite, had been seen with a gashing , life threatening wound in his chest, most probably caused by barbed wire. I couldn’t do anything for him. I had let him down, too. These two events have fed my desire to learn about horses like a raging fire for the last 40 years. At 19, I enroll in University to study Veterinary Medicine. I feel “I have arrived in my life". Three years into that, I meet a man and shortly after, get married! Before I know it I am pregnant with my first daughter and my husband is transferred to a job abroad. That is the end of my veterinary studies…. In my mind, I am letting horses down again. Fast forward a few years and now I am 44, the kids have grown up and I still want to go and help horses. The whole time, I am so single-minded about what I thought was the welfare of the horses in my charge that, I am ashamed to have to admit, I neglect my daughters … my family….my husband…and myself. With my daughters about ready to leave home to go to college, I start getting restless again. After some research and consideration, I decide to become an “equine body worker”. So I get my qualifications and then spend the next 3 years helping a lot of horses be more comfortable physically. During these 3 years I had the fortune of being offered a fabulous horse to compete and I spend 2 years training and travelling up and down the motorways, chasing qualifers to make it to the Dressage Winter National Championships. I thought that would mean I was successful. That would bring me status and more clients…. Two years later that horse was sold (he wasn’t mine) and that was the end of that. Heartbroken one more time, I spent the next couple of years horseless, trying to put my live together again (my marriage had come to an end and I had an empty nest). By now I have a very considerable base of equestrian knowledge and clients and status. I am actually making a living helping horses, but still I feel I am not serving horses in a way that truly makes a difference to them. I am still searching, still striving, still wanting…. What was missing? At this time I am offered the opportunity to be the Business Agent of a reputable Horsemanship Programme. They are based in Australia and need representation in my area. I feel recognized, accomplished… now I had really arrived, hadn’t I? I spend the next 7 years working as hard as I can helping this company reach as many horse people in my area. Towards the end of my 7 year career with the Australian Company, serendipity had it that I joined forces with a very special lady that helps people transform the relationship they have with themselves so they can create healthier relationships with everything else in their lives. 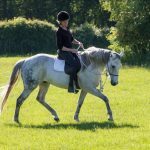 I approached her because I found that even though I had what I considered the best programme available for people to get the best out of their horses, the same issues crept up time and time again for these people…. Their “skills” were getting better and they could “do” more things with their horses… but the core issues were still there. There were tears at my lessons when people felt moved by what their horses were bringing up for them (frustration, anger, fear…. And sometimes happy tears, too!). Working with this wonderful lady was my big breakthrough. She helped me find the missing link in myself. I needed to “believe” that I could “be” that person that can help horses. This inner breakthrough caused me to start questioning what I had been doing thus far. I was restless and I actually got sick. Sick enough that I had to call it quits on all the pressure I put on myself to please others. I took it as a sign. It was my time to shine… to be brave and put myself out there and share my message. And whilst all this is going on inside me, life brings big changes for me (coincidence?). Very unexpectedly, I am asked to join as a business partner in a big horse property in Spain. After 25 years of a very good life in England I find myself packing up and moving with my wonderful partner and 4 horses, to sunny southern Spain! My business partner’s dream is to create a holistic haven for horses – she needs someone with the know how to help her put it all together. It was just so perfect…. Serendipity hits again! After a year of soul searching and hanging out with the horses, Softness Training is born! I have put my life experiences together and have created a programme that helps people learn how to read their horses so they can take that feedback and be and\or do what they need to do to connect with them and create amazing partnerships with them. From first timers to experienced equestrians, the feedback has been heartwarming. 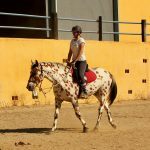 My combination of skills and experience make me a very empathetic, insightful coach with acute horse sense that will empower you to get the best out of you and your horse. 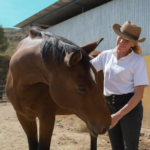 I look forward to meeting you either in my Virtual Classroom or in person, at beautiful Finca La Teja Horse Center , where I am based in Andalucía, Spain. In the meantime, please let me know if I can support you in anyway. Below is a link to my personal email account. I look forward to hearing from you. No question is too silly! Please feel free to reach out to me – I love helping people! Please feel free to reach out to me. I love helping people!